Transfers to and from your Alice Springs accommodation are included with every flight. We may not be able to pick-up from some properties located in rural areas and outskirts of town centre, please enquire at time of booking. After your flight toast your morning experience with sparkling wine and fruit juice. This will give you time to truly appreciate the vast tranquility of the desert before returning to your accommodation. You will be with us for around 4 hours commencing approximately 1 hour before first light. * The total price includes a mandatory Civil Aviation Authority Insurance. This insurance charge is $30 per person and applies to all passengers regardless of age. Child age is 6-16 years. Children 3-5 years are not recommended but considered on an individual basis. 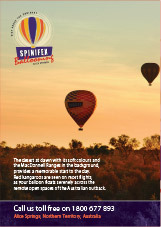 # For those in the group that would like to come and watch their friends/family enjoy a hot air balloon flight. They will travel with the crew to where the balloon lands and meet up with the rest of the party to enjoy the light refreshments. Must be booked in conjunction with at least 1 adult balloon flight. ** Depending on many operational factors, which vary each day, passengers may be on the ground or in the balloon when the sun is actually coming over the horizon or rising, either way you will still see an amazing dawn. All prices are valid from 1 April 2019 to 31 March 2021.